The M15 / 42 was based on the hull of the M14 / 41: the rear was redesigned and was extended by 15 cm to allow the installation of a new engine, or the FIAT-SPA 15TB M.42 with 12-liter displacement. The apparatus was no longer diesel because the stocks of diesel were constantly decreasing, but was fueled by petrol; it was a V-shaped 8-cylinder engine and developed a power of 170 hp (190 hp at the test bench). So a new transmission and a manual transmission with eight forward and two reverse gears were added. The main tank contained 367 liters of fuel and there was a reserve tank with an additional 40 liters; the autonomy turned out to be 220 kilometers by road at a speed of 38 km / h and descended to 130 kilometers / ten hours on land at a speed of 20 km / h. The mechanics remained identical. Each side rested on eight supporting wheels, coupled two by two by horizontal elements; each pair was hooked to an arch-bent arm, constrained at the other end to a rocker arm joined to the hull by a pin. Over each pair of arms was therefore ensured a semi-elliptical leaf suspension, connected to them by links and two bushings. The rolling train was completed by three upper rollers, the rear idler wheel and the front drive wheel. The increased length of the hull recommended the adoption of longer tracks with eighty six links and 260 mm wide. This system, however, was not updated in relation to the new engine and therefore the tracks tended to come out of the seat during the high speed gear: after the first deliveries four large teeth were added in the drive wheel groove to solve the problem. The M15/42 exposed at Saumur museum, seen in three-quarter front: you can see the pair of machine guns Breda Mod. 38 in casamatta and the 47/40 cannon. Hull and superstructure were the subject of some marginal modifications: the first had four circular openings, two rear openings and one on each side. The crew's access door was moved to the right side of the superstructure, the armored protection of the casemate machine guns was better designed, the two mufflers (one on the left and one on the right of the hull) each had an armored heat shield. As the production proceeded, the two racks of cans on the snout of the hull (inherited from the last batches of M14 / 41) were integrated with five more placed on the sides of the superstructure and on the back of the hull was installed a box containing smoke. Finally, the 8 mm anti-aircraft Breda Mod. 38 machine was removed, held in the hull when not in use. The M15 / 42 was characterized by the new turret armament, the 47/40 Mod. 1938 piece of 47 mm along 40 calibers, with a higher initial speed, a brighter trajectory and a greater range compared to the previous cannon of the same caliber 47/32 Mod 1935. The main grenade supplied was the EP model ("ready effect"), a quarry charge that reached 900 m/s: it was capable of piercing a 112 mm thick armor by 100 meters, 60 mm by 500 meters, 43 mm by 1000 meters and 24 mm by 2000 meters. They were also supplied with EPS grenades (due to "special ready effect", ie HESH projectors) that beat 115 mm thick armor regardless of the distance of the target. The on-board armament was completed by two Breda Mod. 38 machine guns in casemate and by a third Breda Mod. 38 coaxial to the cannon, which could be removed from its carriage and used in anti-aircraft function. The loadable reserve amounted to 111 grenades for the cannon and 2 640 cartridges for the machine guns. On either side a large circular hole had been made to use portable weapons from the inside. The tower was tilted by an oleodynamic system and covered the whole horizon; the raising of the gun was manual and ranged from -10 ° to + 20 °. The crew counted four people: the captain sat in a turret with the gunner / loader; the pilot found a place in the hull on the left, and on his right was the machine-gunner. 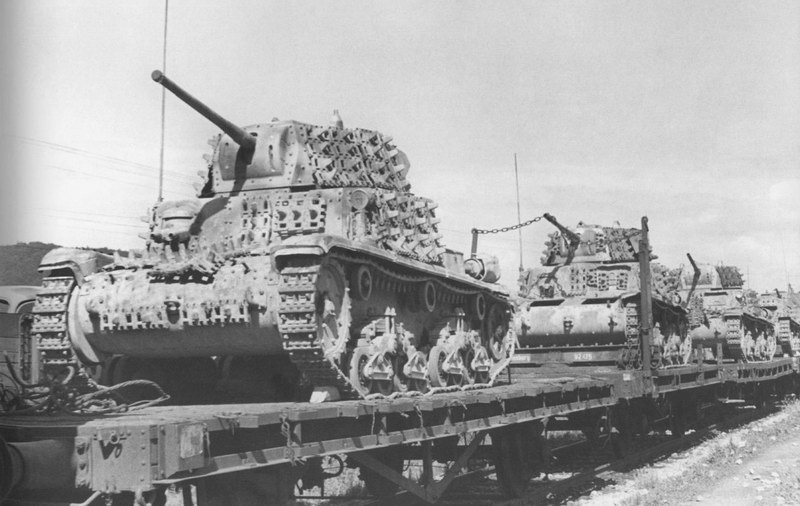 Overall the M15 / 42 weighed 15.5 tons. It was 5.09 meters long but both the height (2.37 meters) and the width (2.28 meters) remained those of the predecessors M14 / 41 and M13 / 40; the free light measured 41 cm. The turning radius was 4.50 meters and was able to overcome obstacles up to 0.80 meters high, fords 1 meter deep and 2 meters wide ditches. Also, judging by what most museums say (including the Musée des blindés de Saumur), the M.15/42 was supposed to be able to reach 40km/h. Of course, but since he decided to use the usual designation I thought I would correct him on it. Anyways, I think it would be better to use the official designation that you just gave. I'm not convinced by the penetration values. I've have always heard that the 47mm HEAT rounds proved to be unsuccessful, and that's why they decided to elongate the barrel in order to achieve better performances for the APHE round. Furthermore, the text says that the EP rounds were HEAT, while the EPS HESH, but in fact it's the opposite. No, the cannon was good! But we will see in detail by officials sources. This was standard practice? Now here is a tank that really does deserves the Add-on Armour upgrade. Hopefully the devs impliment this. and how do you know? R you working on that? I think he's just saying "of course we hope they implement it". "Late production M15/42s replaced the second spare road wheel with rear mounted smoke generators." If anyone has a picture showing this feature (or the vehicle manual, which would hopefully also describe its employment and the amount of charges) it would be appreciated. Of course, I just noticed that it wasn't mentioned in the OP so I wanted to "spread the word", not to mention that I don't have a single picture showing it, so I was quite curious myself. I was quite curious myself. Ah, yes, I had guessed as much. Very interesting, hope they don't forget to implement it into the tank once it comes out. I have a couple of questions about the performance of the 47 mm L40 cannon. Premise that the guns data in game still need to be fixed and that I don't want to discredit the reliability of the developers, I would however like to go further into this question, just my curiosity. 1) There is not much documentation on this cannon, from the little that I found on the net it seems that this cannon was developed to fire a 47 mm projectile with considerably larger cartridge, then with greater energy. In game these performances are declared, muzzle velocity equal to 755 m/s, not a big improvement compared to the previous 47/32 with 630 m/s. Needless to say, I was hoping for something better, but apart my personal impressions, on other sources a much better performance is mentioned, equal to 900 m/s, but I don't know if it's reliable. 2) Another question, the 47/40 projectile is the same as the 47/32, but shot at higher speed, or is it a new bullet? I ask this because I see the same grenade in game for both of us. I ask me if instead, having developed a bigger cartridge, a heavier projectile was also developed. Does anyone have any more data that can clarify my basicr knowledge? The only thing i can say is that the current values in game are still placeholder. But they are not that far from it' s real values. Just a little underperforming, non much actually. I might be wrong, but the actual penetration of the 47/32 and 47/40 are unique and not copy-pasted, so they already made calculations for these guns. Now, if they were already calculating the penetration values, why did they made wrong calculations? It's nonsense. That's why I think the actual penetration capabilities are working as intended.